We are pleased to announce the launch of the electronic communication system at Charlotte Hall Veterans Home. Touchtown allows more effective communication with residents and staff via TV's throughout the facility, including bedrooms. The program provides information on daily activities, menus, and important announcements, in addition to real-time date and weather information. There's also an audio feature to help those who are visually-impaired. The channel can easily switch to watch live activities in the Main Multipurpose Room for those who are unable to leave their rooms. MDVA would like to thank the American Legion Post 82 and Masonic Lodges throughout Maryland for sponsoring this wonderful project, valued at almost $20,000! 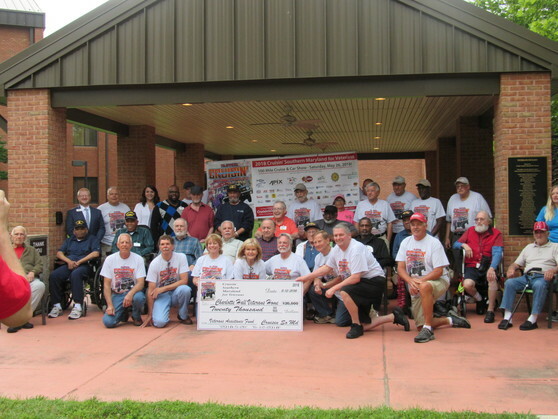 In the photo above, another large donation of $20,000 was made by Cruisin' Southern Maryland to Charlotte Hall Veterans Home. The 7th Annual Car Show, sponsored by Cruisin' Southern Maryland to benefit Charlotte Hall was held on Memorial Day weekend and the proceeds were donated to Charlotte Hall on June 12th. 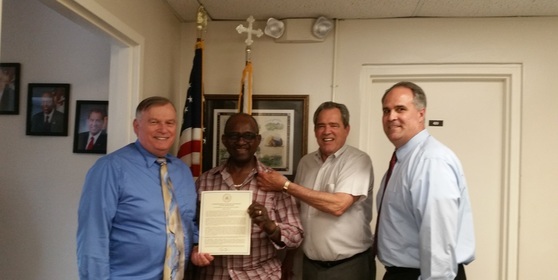 Over the last seven years, Cruisin' Southern Maryland has raised over $102,000 for Charlotte Hall Veterans Home. Thank you to all the members, friends and supporters of Cruisin' Southern Maryland for your generous, ongoing support! Mr. William E. Murray recently stopped by the MDVA office in Annapolis to visit his daughter, Stacey Crawford who is a MDVA employee. Secretary Owings discovered that Mr. Murray served as a Hospital Corpsman in the United States Air Force, and pinned him with the Vietnam Veteran Lapel Pin. Shown in the photo from left to right: MDVA Deputy Secretary Robert Finn, Mr. William Murray, MDVA Secretary George Owings, and Mr. Chris Piscitelli, Director of the MDVA Cemetery and Memorials Program. Ms. Portia S. Wheatley is a veteran and organizer of the annual Maryland Military and Veteran Women Business Conference. 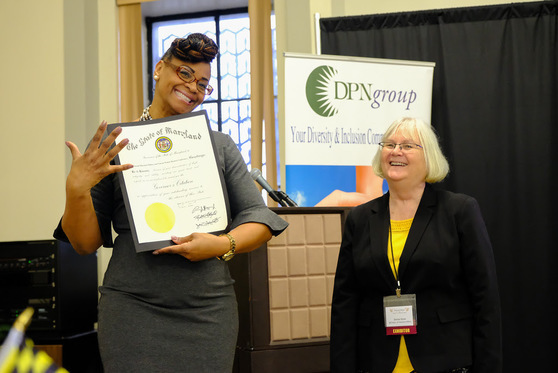 In this photo, Denise Nooe of the MDVA is presenting Ms. Wheatley with a citation from the Governor, commending Ms. Wheatley for her dedication and support of women entrepreneurs. This event was the 5th Annual Conference and was held at the War Memorial Building in Baltimore. Watch for the 6th Annual event in 2019! The Maryland Lottery and Gaming Control Agency is pleased to introduce a high earning gaming product especially designed to benefit Maryland Veterans’ organizations. The instant ticket lottery machine (ITLM) is a modern gaming vending machine with spinning video reel animation that brings fun and excitement to your members. Currently, 84 Veterans’ posts in Maryland have ITLMs installed in their locations. As of May 30, 2018, the ITLM Program has contributed over $13,600,000 in total profits to the participating Veterans’ posts. The Maryland Department of Natural Resources has partnered with libraries in four counties to enable their patrons to borrow fishing gear free of charge. The Aquatic Resources Education Program has provided five libraries in Anne Arundel, Carroll, Frederick and Harford counties with rods and reels, tackle, and fishing books, specifically geared toward children. The following libraries are currently participating in the department program: Eastport-Annapolis Neck Community Library and Mountain Road Community Library in Anne Arundel County; Westminster Branch Library in Carroll County; Brunswick Branch Library in Frederick County; and Joppa Branch Library in Harford County. The success of a 2017 pilot program at Mountain Road Community Library in Anne Arundel County prompted the department to expand the program to four additional libraries, which are all in close proximity to public fishing areas. These libraries have partnered with local fishing clubs and enthusiasts to ensure proper inventory levels and maintenance of the equipment. The U.S. Fish and Wildlife Service Sport Fish Restoration Program helped fund the innovative program. Information on Agent Orange "Presumptives"
Frederick County & Hagerstown, MD - At 11:00 AM on Saturday July 21, 2018, Hannah Y Kim, a woman with a mission, will visit the Korean War Memorial in Frederick County and present a commemorative wreath. Following the ceremony at 4:00 PM, Hannah will participate in a motorcycle run down Korean War Veterans Memorial Highway starting in Mt. Airy. Bikers and veterans are due to arrive at the Korean War Memorial in Hagerstown at 6:00 PM, just in time for the ceremony at 7:00 PM. This whole day is part of an ambitious three-month journey visiting Korean War memorials in all 50 states, to honor and remember those who served in that long ago, faraway conflict, 1950-53, and to help promote peace on the Korean Peninsula. Given the current peace talks in the region today, her mission could not be timelier. Several representatives from veterans organizations will be present for the ceremonies, which are open to the public and the media. Following the ceremonies, Hannah Y Kim will be available for media interviews. Women have served and fought in every conflict since the American Revolution, yet despite their critical contributions to our national security they continue to face barriers within the military and when accessing the VA benefits and services they have earned while defending our nation. An advisory group of military women's organizations, convened by the Service Women's Action Network (SWAN), have joined forces to reach out to and connect with other military organizations across the country that primarily support military women. Whether you are a formal or informal organization, a social group or a Facebook group for service women and women veterans, we are asking you to join us in Atlanta on September 7, 2018 to participate in an inaugural meeting to form a Military Women's Coalition. The coalition will elevate the voices of the current 2.2 million U.S. service women and women veterans and unite them to become a powerful force for change. All military women and women veterans groups, including grassroots groups, social groups, Facebook groups, nonprofit groups and similar organizations are invited to join the Coalition. Register here. A limited number of travel stipends are available. Make sure you have a chance to shape the agenda for the Coalition meeting and training workshops! Please complete this survey that will help us answer the questions: Can U.S. service women’s organizations benefit by participating in a coalition of organizations? If so, what benefits, shared expertise, and topic areas would organizations like addressed through a coalition? Results of this survey will be reported back to you and will be discussed at the inaugural convening on Sept. 7 in Atlanta.